1 of 2 Bring a pot of lightly salted water to a boil. Add snap peas; cook 1 to 2 minutes, until crisp-tender. Drain snap peas; run under cold water until cool. 2 of 2 In a large bowl, whisk together oil, vinegar, tarragon and salt until well combined. 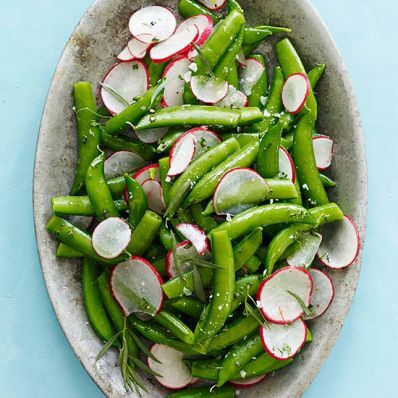 Toss snap peas and radishes in dressing. Season with freshly cracked pepper. Serve at room temperature or chilled.